For year-round, all-weather motorcyclists, poor weather can be a real pain in the a***! So having waterproof gear is an absolute must - especially during the winter and spring months when rain is in abundance. So here at MCN we’ve once again taken to the keyboard to share the top five waterproof motorcycle jeans. We have chosen these based on both customer preferences and cost effectiveness - to help you get more for your money. The Dojo Hara Jeans are quite possibly some of the cheapest waterproof motorcycle jeans on the market - but that doesn’t mean they skimp on quality; far from it! They’re made from fully waterproof material with a 60D outer shell construction and include CE approved knee armour, thermal liner and can be easily attached to ARMR or Dojo jackets with the zip attachment. In addition the jeans also include stretch panels for added comfort and reflective detailing to help keep you visible at night. Yes, they are at the lower end of the budget but if you’re stuck for cash and need a comfortable pair of waterproof jeans then you could do far worse than these. Buffalo have delivered a great pair of waterproof jeans that are not only at the cheaper end of the scale but are superb value for money. 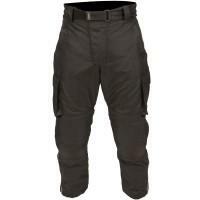 They are constructed from waterproof polyester with a velcro fastening half-belt and CE approved knee armour. They also include a zip attachment to connect to a Buffalo jacket and reflective detailing to keep you visible at night. But it doesn’t stop there! 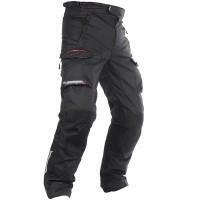 These great jeans also have a removable thermal liner that can be taken out should the weather start warming up. If you’re looking to save money but don’t want to skimp on quality then you can’t go far wrong with these waterproof motorcycle jeans. 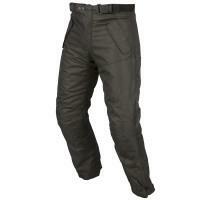 So moving on to a more “mid-range” pair of waterproof jeans we have the RST Blade Textile Jeans. These jeans are made using a Sinaqua waterproof membrane with a Ballistic 1660 and Matex outershell to keep you dry whilst motorcycling. 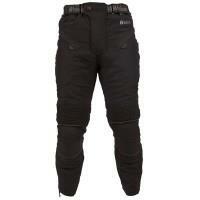 They are also triple and double stitched with super-strong bonded nylon and include CE approved knee protectors. As you would expect they can be attached to an RST jacket using the zip attachment provided with them. The jeans also come with a removable thermal liner to keep you warm in the winter months but can be removed when the weather starts to warm up. 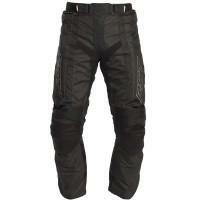 For the price the quality of these waterproof motorcycling jeans is fantastic - and will keep you dry and comfortable. Oxford is by far one of the most established leading suppliers of motorcycle kit and the Oxford Continental Textile Jeans do not disappoint. Made from matt finish polyester and a waterproof Hipora layer with secondary waterproof layers around the knees, seat and crotch areas there’s no danger of getting wet whilst wearing these bad boys! They include CE approved knee and shin armour, heatproof inner leg panels and reflective panels for maximum visibility at night. Yes you will pay a bit more for these but for the sheer value and extras we think it’s worth it. The Weise Titan Sport Jeans are a great pair of waterproof, comfortable motorcycle jeans that definitely deliver on quality. With a 500 Denier strong nylon construction combined with an ISOTEX waterproof and windproof inner-lining, these are perfect for those long rides on wet and windy days. The jeans also include CE approved knee and hip armour, 3M reflective piping to keep you visible at night and a detachable thermal lining that can be removed when the warmer weather kicks in. They are pricier than some of the other waterproof motorcycle jeans in this list but for the quality of the build they are an excellent accessory when riding.